Amber Ortega-Perez and Charles Perez in The Proximity of Being, film by John A. Borrego, creative direction by Barbara Felix. Lighting and photos by John Ward. The Proximity of Being will be on view as part of Luminaria on Nov. 11. For San Antonian Barbara Felix, the human form is a never-ending source of fascination. 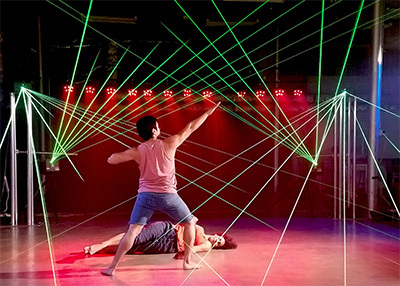 As a visual artist and longtime dance fan, she had an idea for a project that would allow body language to tell a story of connection and solitude. 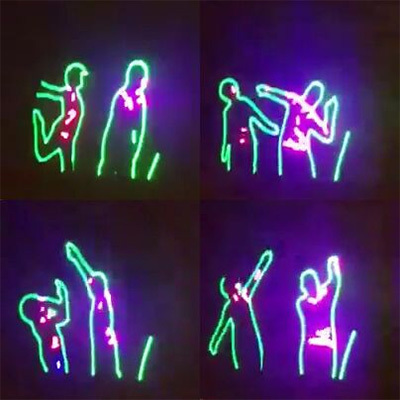 Enter The Proximity of Being, a collaborative digital art installation with hand-drawn animations of dancers by Felix making its debut at San Antonio’s annual outdoor arts festival, Luminaria. After working with videographer James A. Borrego of Cine Studio San Antonio to capture several minutes of choreography by local modern dancers Amber Ortega-Perez and Charles Perez, Felix has spent the better part of the past two months hand-drawing still shots from the video footage to create animation sequences, which will be projected onto Coroplast cubes piled 12 feet high in a pyramid. The installation will be on display the evening of Nov. 11 in Dignowity Park as part of the free-admission Luminaria Arts Festival. Felix, a B.F.A. graduate of Texas State University, didn’t pursue art until her first figure-drawing class in college. “I saw the potential and it’s been a love affair with the human figure ever since,” she said. Felix also took her first dance class in college, but wound up severely injuring her back in a car accident and wasn’t able to pursue dance any further; but her appreciation for the human body never died: “I’ve always loved the shapes that our bodies can make,” she said. As she honed her skills, Felix realized it was important for her to have a “real face” to copy — one she could view live in close detail — to make her dancers more realistic. So she began making her dancer drawings self-portraits, inserting her own face onto the bodies. This resulted in her 2016 solo gallery show Bailando con mi Misma (Dancing with Myself). After being encouraged by the gallery owner to submit a proposal to Luminaria, Felix had to quickly assemble her team for the project that would become The Proximity of Being. She enlisted John Ward of Laser Ninja Productions to help her figure out how she was going to project her work and onto what, and brought on Borrego as the videographer. Next, she needed dancers. 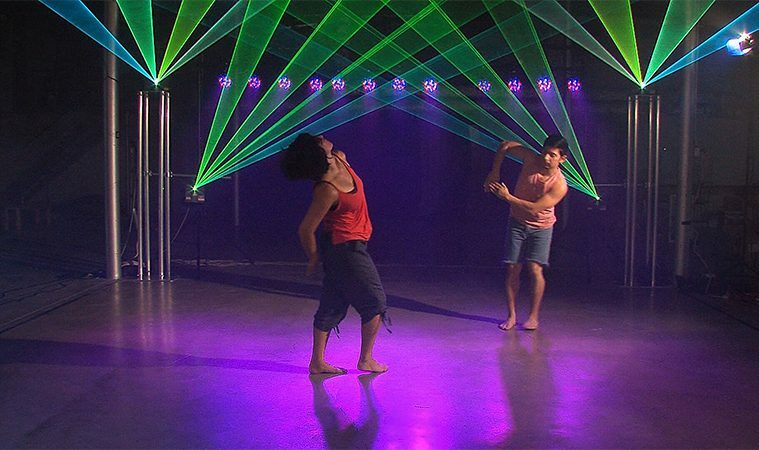 An Internet search brought up modern dancer Amber Ortega-Perez, a native of San Antonio big on contact improvisation — a postmodern dance technique in which two people move together while always maintaining physical contact to explore movement improvisation. “The proposal for Luminaria was due on a Tuesday, and I found Amber on a Thursday,” said Felix. The pair clicked when Felix described the core themes of the project: connection and solitude. Ortega-Perez and co-creator Charles Perez, who have worked together the past three years, developed a number of sequences that were filmed against a green screen. Ortega-Perez said the sequences were structured like “games” with rules that would force the couple to separate and come back together. Each game created a phrase that could be further manipulated. 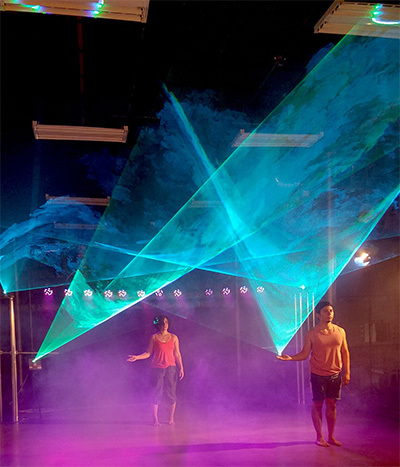 While the choreography had structure, it also left room for choice. From there, Felix selected sections she would turn into animated sequences, with each frame taking anywhere from 30 minutes to two hours to draw, depending on the level of detail. In some of the sequences, Felix painted the dancers’ shadows in watercolor for an added touch of vibrancy to the black-ink drawings. In addition to the animation sequences, the projections on the cubes will include clips from the dance films, dance drawings and text animations with the words “proximity” and “being” along with their respective synonyms and antonyms.